Some shows are like comfort food. I put on Parks and Rec whenever I need a pick me up, or good laugh, or I simply don't know what else to put on. I know that Leslie, Ron, Ben, April, Andy, Tom & Donna will keep me company while I fold laundry or cook dinner. Leslie, in particular, is a favorite character of mine. A civil servant who simply cares too much - about her town, her job, and her friends. Galentine's Day is a Leslie Knope tradition, when she gathers all her female friends for brunch on the day before Valentine's Day. And what better brunch than some waffles from JJ's Diner? I took inspiration from some of my favorite Parks & Rec characters (ok, they're all favorites, but here are 4 I thought of recipes for), and created a different waffle for each. 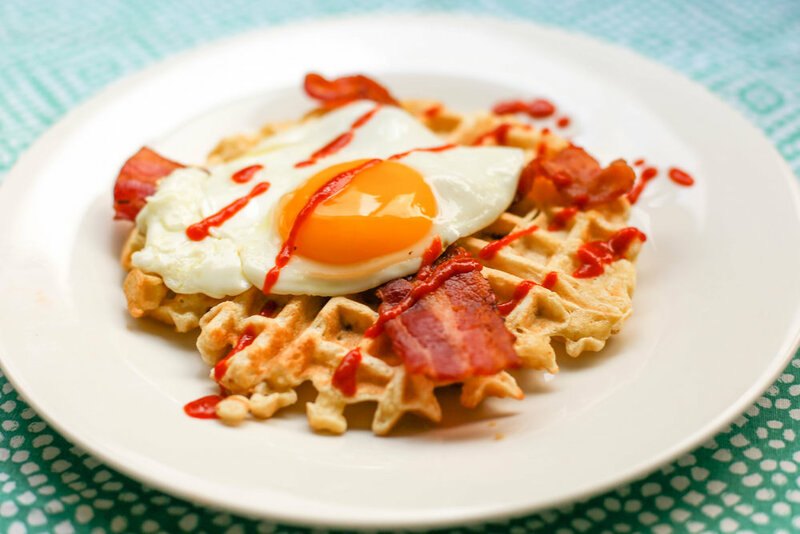 The base waffle recipe is purposefully very plain, since it would be the base for different sweet and savory combinations. If you're keeping it simple, I might recommend adding a splash or vanilla extract to the batter, or maybe even a sprinkle of cinnamon. Happy Galentine's! In a large bowl, mix together flour, baking powder, sugar and salt, and set aside. In two smaller bowls, separate the egg yolks from the egg whites. Use a hand mixer to whisk the egg whites until soft peaks form. Set aside. To the egg yolks, add the milk and vegetable oil. Whisk together, then add to dry ingredients and mix. Add melted butter and incorporate. Lastly, add egg whites and fold in until no streaks remain. Scoop batter by 1/2 cup into waffle iron and cook until desired brownness. Leslie's favorite style of waffle, and one we've seen in countless episodes. For a classic JJ's Diner style waffle, simply top with a healthy dose of whipped cream. No Parks & Rec celebration is complete without Ron Swanson. Crumble 2 strips of bacon into your 1/2 cup of waffle batter. When the waffle is cooked, top with 2 more strips of bacon and a fried egg (or 2 if you're a real Swanson), and your favorite hot sauce. For the health-conscious, Chris Traeger in all of us, top your waffle with some protein-packed greek yogurt and antioxidant rich blueberries. Plus some honey for sweetness and granola for crunch. Treat yo self 2018! Go over the top with as much ice cream, whipped cream and chocolate and you can handle! And then maybe a little more.